We’re proud to support a growing community of developers who collaborate with each other and invent new ways to use SmartThings. This community is propelling the open Platform for the Programmable World. In the latest in a series shining the spotlight on developers in the SmartThings community, we’re going to get to know Florian Zitzelsberger, who (aside from having the most epic name of any developer to date) is the mastermind behind the wildly popular wall-mounted Home Automation Dashboard. ST: Hey Florian. Why don’t you start by telling everyone a bit about yourself. FZ: I’m a software engineer in the San Francisco Bay area. At home, I spend most of my time tinkering with electronics and hanging out with my family. I am always up for a cup of coffee or trying delicious new foods. I love films, cars, and I’m a dog person. There… now, you know everything about me. ST: What led you to start using SmartThings? FZ: I learned about SmartThings during the Kickstarter campaign. I wasn’t ready to jump on it back then, but I had always dreamed of living in a “connected home.” I was able to finally make that a reality when my wife and I purchased a house a little over a year ago. Frankly, SmartThings remains the best home automation system out there, combining ease of use with customizability. Your support staff is super responsive, and the community is incredibly helpful. 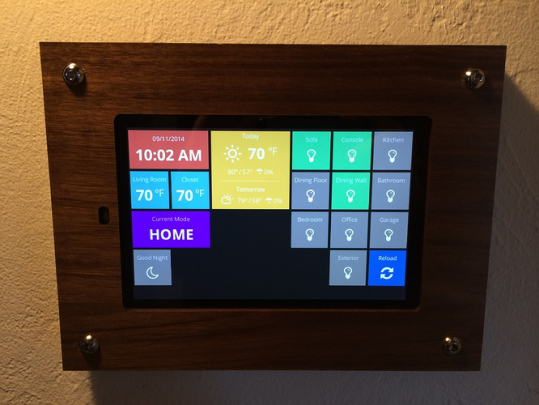 ST: You recently created a Home Automation Dashboard that got rave reviews from the Community. What was the inspiration behind it? FZ: The only way to control things is either through physical buttons–if available–or with the SmartThings mobile app. On some devices, such as power outlets, the controls are inconveniently located, and a lot of things do not even provide a way to physically interact with them. For example, there is no way to read out temperature sensors other than by launching the SmartThings mobile app. I wanted a solution that bridges the gap between the fully featured functionality of the SmartThings mobile app, and the limits of physically interacting with my things. I thought it would be cool to set up one or more tablets, running an interface to SmartThings which would allow basic control over my things. ST: How did you put it together? FZ: I decided to wall mount an Android tablet. The Android tablet was chosen mostly due to cost and customizability, but an iPad would have worked just as well. For the mounting solution I built a custom frame from lasercut pieces of walnut veneer made by Ponoko. However, there are some off-the-shelf frames, as well alternative do-it-yourself solutions available. A simple Google search will give you some ideas. As for the software, I thought long and hard about what this interface would look like, and eventually stumbled across Dashing, a dashboard framework developed by the talented folks at Shopify. I modified the framework to better work with mobile devices, as well as support interactivity, and I created a number of widgets to interact with a SmartApp to let me control my things. A few users from the community even submitted more widgets: A big shoutout to @bmmiller, @Dianoga and @mattjfrank. I wanted the Dashboard to be intuitive, even for house guests who may not be familiar with home automation, so reliability and ease-of-use was paramount. I was able to achieve this in part by deploying the dashboard application as a Web service in the cloud. My things are now remotely controllable from essentially any Internet-connected device with a Web browser. As icing on the cake, the wall-mounted tablet runs the Web browser in full-screen mode, and uses the camera as a motion detector to automatically wake up to the dashboard screen, when someone approaches the device. This functionality is courtesy of the Android apps Tasker and Motion Detector. In case you are intrigued now, you can check out the project with installation instructions on my GitHub page. 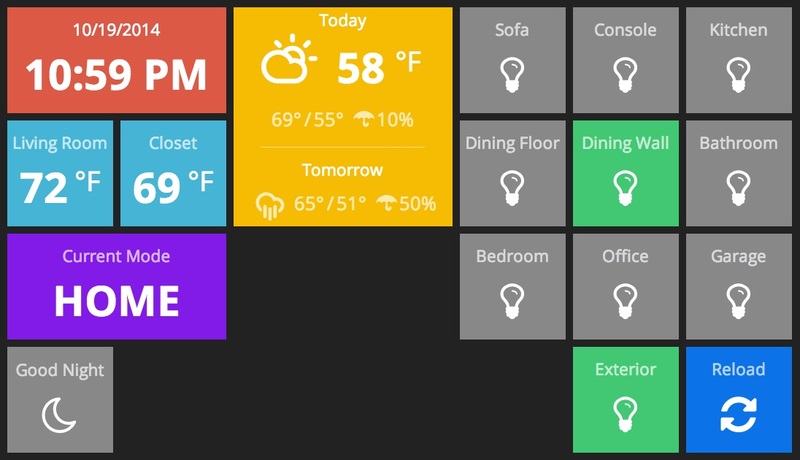 ST: With the dashboard in mind, what are your thoughts on how people may interact with their smart homes in the future? FZ: I believe that in one way or another, wall-mounted controllers will find their way into users’ homes. Especially now that touchscreen devices are so ubiquitous and relatively cheap. With regards to the future, I am really excited about the advent of smart watches, and how people may use these devices to interact with their home. A wristwatch is something that I would always have on me, even when I am at home. Smart watches could also provide a way for reliable indoor positioning, opening new doors in the realm of occupancy sensing and allowing the home to react smartly to people’s movements. Finally, I think that interacting with my home through speech could be useful. It is technically possible, but I think that most of the current implementations lack in the accuracy and reliability department. Maybe speaking to a smart watch will eventually solve this problem. ST: Are there any other SmartThings projects you’re working on or want to pursue in the future? FZ: Yes. I’m working on a hardware project for makers. It’s a small device with an Arduino and a Thing Shield on the same circuit board. As a sensor device, it will be able to run on alkaline batteries for long periods of time, and I am also hoping that it will be more cost-effective than the current Arduino + Thing Shield solution. ST: How would you describe SmartThings to someone completely new to home automation? ST: Nice. What do you like about the SmartThings platform? Anything you would want to see changed? FZ: I like the fact that basic home automation and control tasks are easily accomplished, and yet the ability to be able to customize almost every aspect of the experience is extremely valuable. I am able to integrate new devices and add seemingly unlimited “smarts” to my home with merely basic programming skills. Recently, there has been a lot of movement in the home automation space, but there is no other solution that so elegantly caters to basic and power users alike. ST: Anything else you’d like to say? FZ: Sure: Thanks for giving me the chance to talk about my project. If you want to know more, you can check out my GitHub page or follow me on Twitter. Again a big thanks to @bmmiller, @Dianoga and @mattjfrank for their contributions to the dashboard.